President Donald Trump speaks during a roundtable with lawmakers in the Roosevelt Room of the White House, Aug. 23, 2018, in Washington. President Donald Trump escalated his long-running feud with Attorney General Jeff Sessions Friday, calling on him to probe a litany of recurring complaints against those investigating his administration and Democrats. The president's pushback marked the second day of highly public smack down between Trump and his beleaguered attorney general. Trump's anger with Sessions boiled over in an interview with Fox News in which the president also expressed frustration with the plea agreement his onetime legal “fixer” Michael Cohen cut with prosecutors, including implicating Trump in a crime that Cohen admitted. Trump said it might be better if “flipping” — cooperating with prosecutors in exchange for more favorable treatment— were illegal because people cooperating with the government “just make up lies” to get favorable treatment. On Twitter Friday, Trump also complained about the five-year sentence given to a former government contractor convicted of mailing a classified U.S. report to a news organization. Trump said “this is “small potatoes” compared to what Hillary Clinton did.” Prosecutors are calling that sentence handed down to 26-year-old Reality Winner the longest sentence imposed for a federal crime involving leaks to the media. In the wide-ranging Fox interview, Trump also defended himself against talk of impeachment — “the market would crash ... everybody would be very poor” — tried to distance himself from Cohen — “I would see him sometimes” — and said anew that he hadn't known in advance about Cohen's hush money payments to silence women alleging sexual relationships with the celebrity businessman. 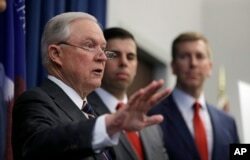 U.S. Attorney General Jeff Sessions speaks during a news conference in Cleveland, Ohio, Aug. 22, 2018. “You know the only reason I gave him the job? Because I felt loyalty, he was an original supporter,” Trump said of Sessions, an Alabama Republican who was the first senator to endorse Trump's bid.